We are pleased to announce the official launch of Readmont 2014, Piedmont’s community read project, now in its fourth year! 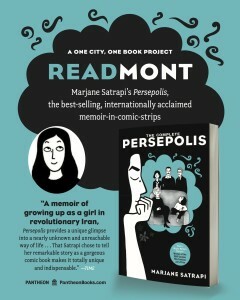 All Piedmonters are encouraged to read Persepolis by Marjane Satrapi, a memoir of the author’s young life in Iran during the 1979 revolution, told in graphic novel (comic book style) format. A limited number of copies will be available for checkout at each school library. Also, A Great Good Place for Books in Montclair is offering a 20% discount on this title. Book discussions will be scheduled in early February. We hope this common reading experience will forge positive connections among students, staff, parents and community members as well as encourage reading as a medium of collaboration. What is the purpose of Readmont? To draw the community together over a compelling story and promote conversation and discussion. What book has been chosen? Persepolis, by Marjane Satrapi, a memoir of the author’s young life in Iran during the 1979 revolution, told in graphic novel (comic book style) format. Why this book? It is educationally as well as emotionally rich and lends itself easily to discussion. Though written for adults, it is accessible for teens and can be explained to younger children. What is the Readmont timeline? The official launch is right after Thanksgiving break. The reading period will extend until February when book discussions are scheduled for the 4th, 5th and 6th. More information on these will be announced closer to the dates. Where can I check out the book? A very limited number of books will be available in each school library. Where can I purchase the book? A Great Good Place for Books in Montclair is offering a 20% discount! Readmont Discussions Upcoming! All interested students, staff and community members are invited to join our facilitated discussions of Persepolis by Marjane Satrapi. Please come to Piedmont High School Room 30 at lunch on Tuesday, February 4th(12:30pm) and Thursday, February 6th (1:00pm) or during tutorial on Wednesday, February 5th (2:15pm). We look forward to hearing your thoughts on this book!